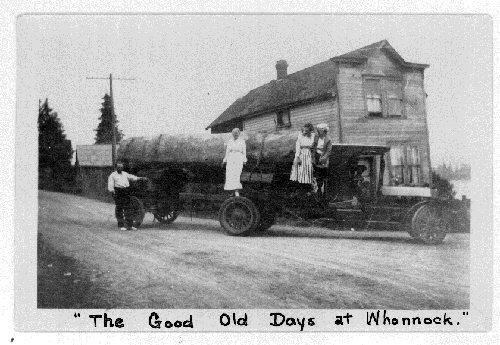 “Day-Elder” logging truck on River Road in Whonnock in 1924-25. The two women (left to right) are Beatrice and Edith Luno. 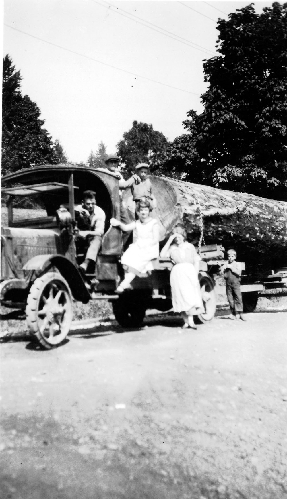 Carl Nelson’s Kissel logging truck on the road in front of the old Luno Store in Whonnock in 1927or 28. Marshall John Luno was one of eight children born to Mary Clarinda Harris and Henry Christopher Luno. He was born on July 21st, 1868, in Ontario. Marshall and Edith Luno moved to Whonnock in 1913 with their three children, Bertha, Beatrice and Gordon. Bertha was born on March 22nd, 1904, in Toronto. Beatrice was born on March 30th, 1906. The Luno family owned and operated Luno’s Service Station and Grocery store with a confectionary and lunch counter on River Road through the depression and then through the Second World War. When the Lougheed Highway was constructed it cut through the Luno property and their business was called the Midway Lunch, being approximately mid-way between Haney and Mission. Bertha attended school at Whonnock, Ruskin and later in Vancouver. She was employed as a secretary for David Spencer’s store, later purchased by Eaton’s. While working in Vancouver she met and married William (Bill) Bennett. During the Depression they moved to Whonnock and later to Webster’s Corners and Albion. They raised nine children together; Raymond Orville, Norman Leslie, William Ross, Doreen Audrey, Gerald James, Marjorie Jean, Ruth Madeline, Maurice John, and Maureen Edith. Marshall died in July of 1939 and Bertha died in August of 1999. Beatrice Adeline married Alvin James Valentine Stoutenburg of Saskatchewan and they had two children together; Marshall James Percy and Campbell Claire.